Held at the Conference “Central Asian Studies Inside Out. 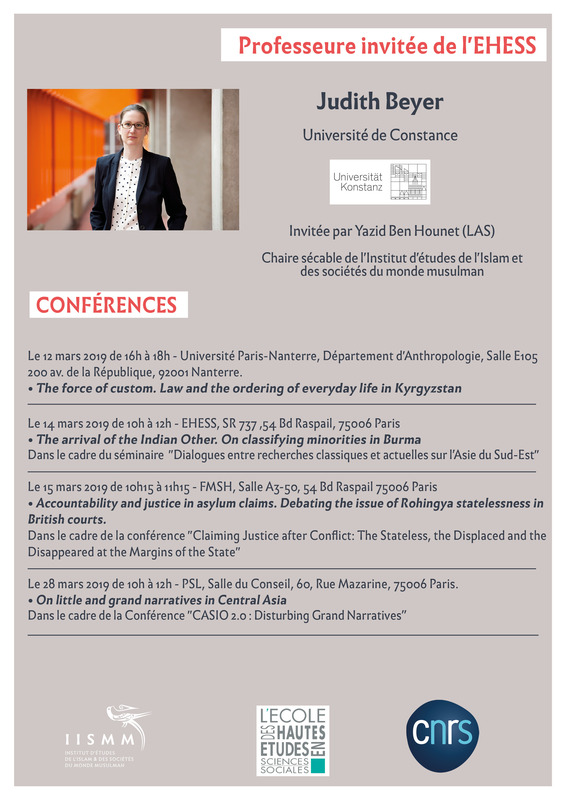 Challenging Grand Narratives”, organized by l’EHESS and ZMO (Berlin). March 28, 2019. Paris. In this keynote speech, I engaged with the conference topic of “challenging” and even “disturbing” “Grand Narratives” through an investigation of the tradition of orality and the usage of oral history in Central Asia. These are two interlinked endeavours, as oral tradition has been investigated “as history” (Vansina) and oral history understood as “the voice from the past” (Thompson). 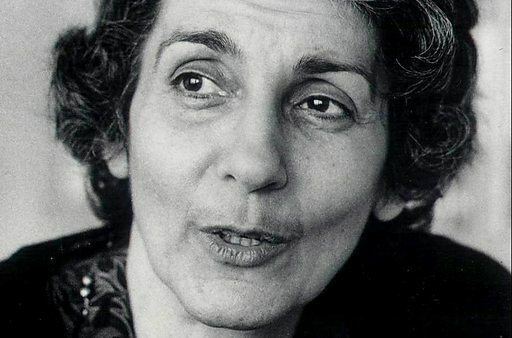 Anthropologists (of Central Asia) investigate tradition as “a site of necessary engagement that aggregates people, … informs policy, public debates, law, and representation, and is – despite its often enough strategic inception – affectively powerful” (Beyer and Finke forth. in Central Asian Survey). Examples from Central Asia show how “oral tradition”, especially when mediated by state and media apparatus, can take on “grand narrative” qualities. Moreover, in contrast to how oral history has been treated in the past, namely as history “from below”, of “the everyday” and by “the little guys” (Graeber), thus as “little narrative”, as I call it, it is worth exploring in what ways this method of ethnographic and historical inquiry has the capacity to yield “grand” results. This entry was posted in Allgemein, anthropology, Central Asia, conferences, field research, Kyrgyzstan, outreach, sociology on 23. April 2019 by Judith Beyer. In 2007 I attended one of my first academic conferences, the Association for the Study of Nationalities (ASN)-Conference in New York, which is held yearly at Columbia University. I enjoyed travelling to New York as I had lived in this city for one and a half years in 1997-1998. It gave me a chance to see friends and my former host family. I thoroughly enjoyed the conference, particularly meeting colleagues I had gotten to know during my field research in Kyrgyzstan (2005-2006) and, for the first time, seeing “big names” in person whose work I had read as a graduate student and when preparing for my PhD-project. I presented a paper on the imagination of state law in Kyrgyz aksakal courts (lit. courts of elders) — the first part of my ethnographic data I decided to work with. I did not expect winning an award for this that early, but I guess part of the reason why I won is that I just followed my intuition to start with the most fascinating part of ethnography that I gathered during my field research. Here is the interview with ASN – go check out their new website, too! You will find more interviews with other scholars as well as a bunch of new resources. In 2007, Judith Beyer wrote an award winning paper on Kyrgyz legal pluralism. Today her academic focus also includes Myanmar and issues of statelessness. ASN: In 2007 your paper “Imagining the State. How perceptions of the state influence customary law in two Kyrgyz communities” won one of the Best Doctoral Students Awards. What was the inspiration for this paper? JB: I had just returned from 15 months of fieldwork in rural Kyrgyzstan and had to decide which part of the data that I had gathered I wanted to work with first. I decided to start with an extended case study I had found particularly intriguing. Part of my research had been devoted to understanding the type of work of the so-called “aksakal courts” (lit. “courts of whitebeards”, i.e. male elders) in the two villages I was working in. This institution can be described as neo-traditional, although the figure of the “whitebeard” and the assumption that (male) elders, in their roles as household or lineage heads, are capable of solving local disputes, goes back centuries in Kyrgyzstan. The paper drew on a particular case I had participated in, centred on questions of divorce, remarriage, separation of property and child support. What intrigued me most, however, was how – in a rural setting where “the state” was experienced as absent, where the end of the Soviet Union had resulted in the demolishing of the social security system, where there was no police and no formal state court – the local court of elders engaged in what I call “performing the state” by replicating what they imagined to be state court procedures. “There is no state here anymore” was a sentence I regularly heard from my informants. Thus, feeling left to their own devices, the aksakalshad to handle their new role as judges by themselves, a role into which they were pushed by new laws on local dispute resolution, enacted after the country had become independent in 1991. In court sessions they tried to create the appearance of a state court and introduced procedures they claimed were derived from state laws. They also invoked the state apparatus as a threat, specifically when people did not want to heed their decisions. While the institution of the aksakalcourt had been explicitly set up in each village of the country to allow adjudication according to “customs and traditions” as a special law on the aksakalcourts stipulated, the elders acted out imagined state law instead. ASN: What stage in the graduate program were you at the time? JB: I was a PhD candidate at the Max Planck Institute for Social Anthropology, where I was a member of the working group “Legal Pluralism” headed by the legal anthropologists Franz and Keebet von Benda-Beckmann. I was also enrolled as a PhD student at the Martin Luther University Halle-Wittenberg from which I then graduated in 2010. ASN: What happened to this paper? JB: I published a first version as a Working Paper and a later version appeared in an edited volume entitled “Ethnographies of the state in Central Asia” in 2014 with Indiana U Press, which I co-edited with Madeleine Reeves and Johan Rasanayagam. I also use the ethnographic material in a chapter of my monograph “The force of custom. Law and the ordering of everyday life in Kyrgyzstan” which I published in 2016 with the U of Pittsburgh Press. 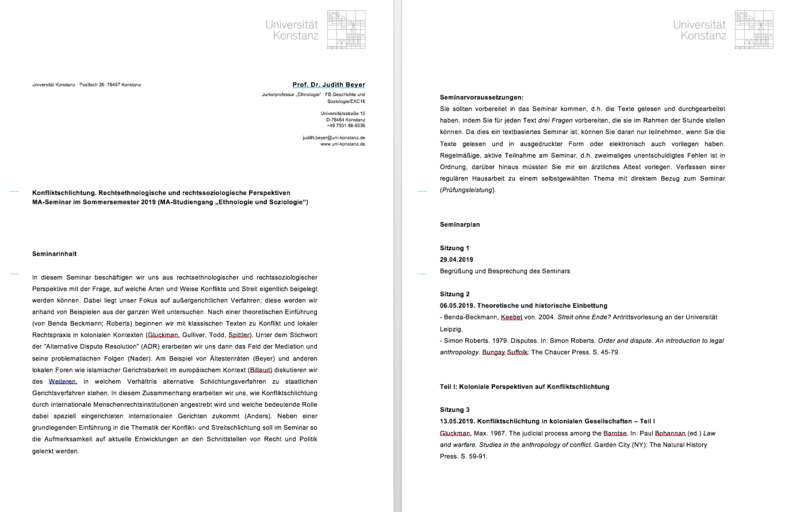 In October 2014 I have been appointed Professor of Anthropology (tenure track) at the University of Konstanz in Germany. From 2010 onwards, I developed a new regional interest in Asia, starting fieldwork in Myanmar. There, I work in Yangon, the former capital of the country, a metropolis of seven million people – quite a change of scenery compared to the Kyrgyz village I used to live in! My interest lies in understanding the positioning of religious and ethnic minorities in this city, particularly Hindu and Muslim groups, their histories of migration from India in the 19th century as part of the final expansion of the British Empire, and their current political situation in a de facto Buddhist state which has had a long history of repressing minorities, particularly Muslims. I am specifically interested in understanding my informants’ strategies of acting as “communities” in order to secure their religious properties as well as to keep a realm of autonomy and self-determination in an increasingly hostile environment. There are, however, numerous overlaps to my research in Central Asia and I have begun to publish comparatively by drawing on my insights from Kyrgyzstan. Most recently, for example, an article on the concept of “transition” that has been so central in scholarly analyses of the entire post-Soviet world and that has now migrated from Central Asia (where I encountered it first) to Myanmar. The article is called “’Transition’ as a migratory model in Myanmar” and has been co-published with Felix Girke. 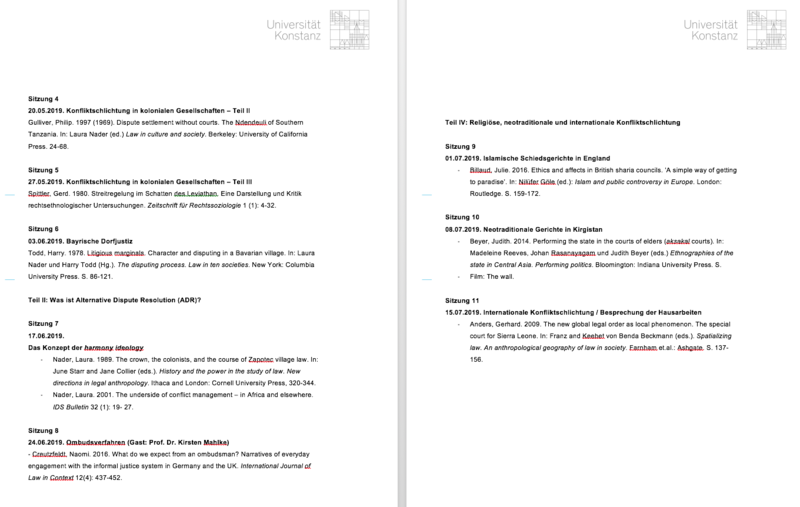 I am also working on new projects related to the issue of statelessness, both in Myanmar and in Europe. Since statelessness is a problem in Central Asia as well, there might be future possibilities to again link my different field sites with each other. 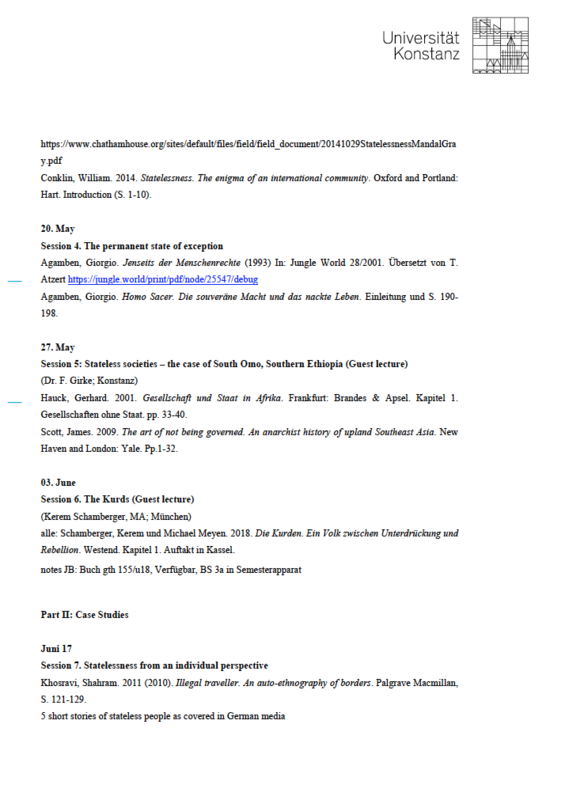 This entry was posted in Allgemein, anthropology, Central Asia, conferences, field research, Kyrgyzstan, Myanmar, outreach, statelessness and tagged anthropology, biography, Central Asia, conference, interview, Kyrgyzstan, outreach, prize on 3. April 2019 by Judith Beyer. 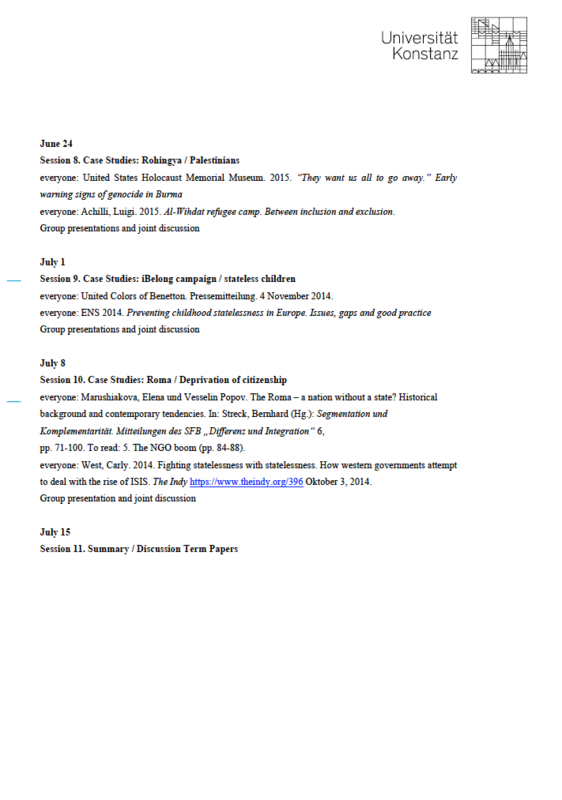 In addition to a course on statelessness at our BA-level, I am also teaching a course on conflict resolution for our MA-students this summer term. Both courses fall under the subdiscipline of legal anthropology, which is my specialization. I am looking forward to exploring legal anthropological and legal sociological approaches to this important topic. We’ll start out by laying the theoretical ground, differentiating between conflicts and disputes, between adjudication and settlement, and between the various institutions that can be addressed for actors intending to file complaints and grievances. In the seminar, we will also have a guest lecturer, who is the current acting Ombudsman (*woman, that is) of the University of Konstanz. Together with her, we will explore the different possibilities the university provides in terms of mediation and solving disputes and conflicts. 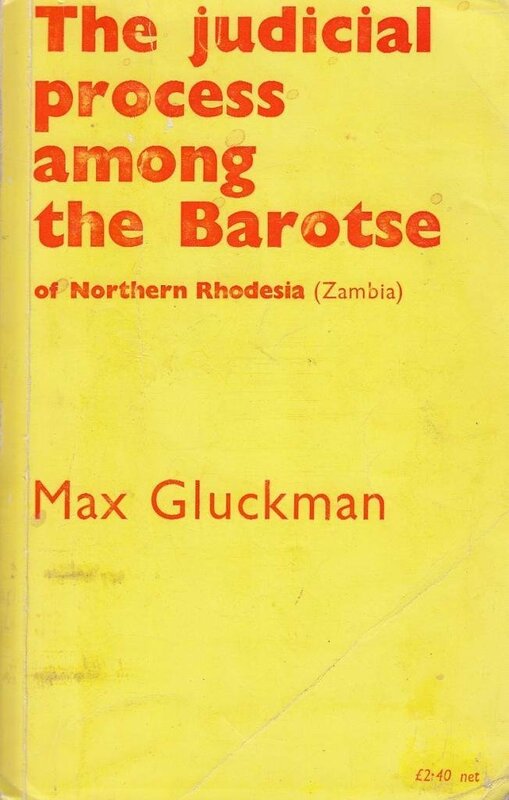 The first part of the seminar is focused on classical publications on conflict and dispute resolution that drew on ethnographic data gathere d in a colonial context (Gluckman, Gulliver). After a critique of this type of literature (Spittler), we will read and discuss a case study on a village in Bavaria (Todd) to turn the ethnographic gaze onto ourselves. We will then familiarize ourselves with the important concept of “harmony ideology” (Nader) within the context of “alternative dispute resolution” (ADR). Through a series of more recent publications, we will approach conflict and dispute resolution in the contemporary era, starting with sharia councils in the UK (Billaud), neotraditional courts of elders in Kyrgyzstan (Beyer), and the particular set-up of international bodies such as “special courts” aimed at conflict resolution in Sierra Leone (Anders). 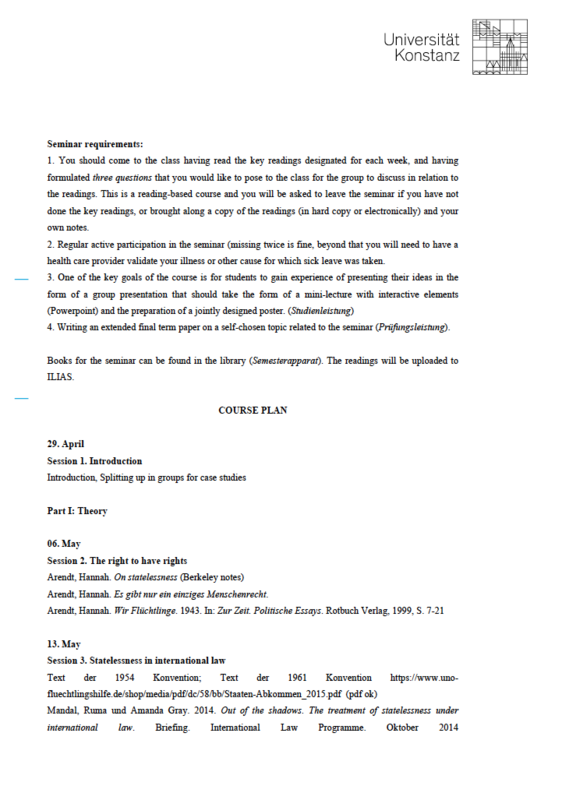 Here is the syllabus of the seminar. This entry was posted in Allgemein, anthropology, Kyrgyzstan, law, sociology, teaching, theory on 8. March 2019 by Judith Beyer. [the transition paradigm] has the potential to become a ‘god-term’ (Burke) as it did in other places … Burke suggests that a god-term is treacherous in that it ‘explain[s] too little by explaining too much (1945:107). Challenging the concept’s current status within the subfield of Myanmar/Burma studies, our task in this article is to alert a regionally interested and educated audience to debates that have been going on elsewhere already decades ago. 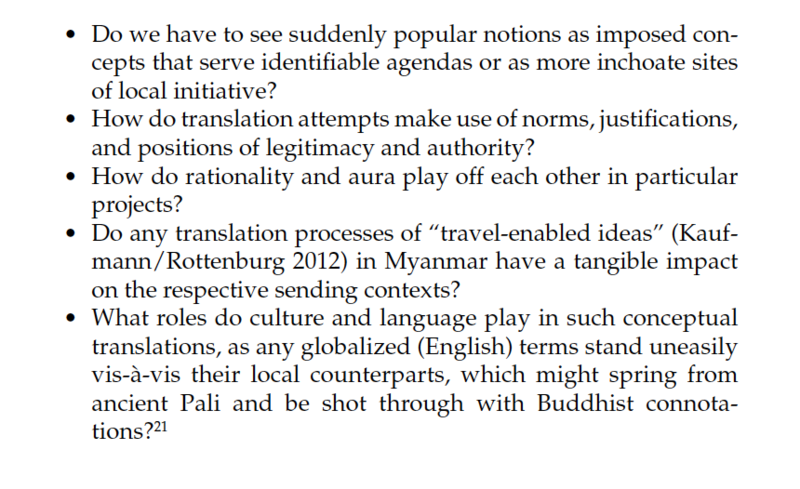 Offering the framework of conceptualizing transition as a ‘migratory model’ (drawing on Behrends, Rottenburg and Park 2014), these are some of the questions we ask in the article. For a full version of the article, see here (paywalled; for a pdf contact me!). This entry was posted in Allgemein, anthropology, Central Asia, Kyrgyzstan, Myanmar, politics, publishing, theory on 21. February 2019 by Judith Beyer. 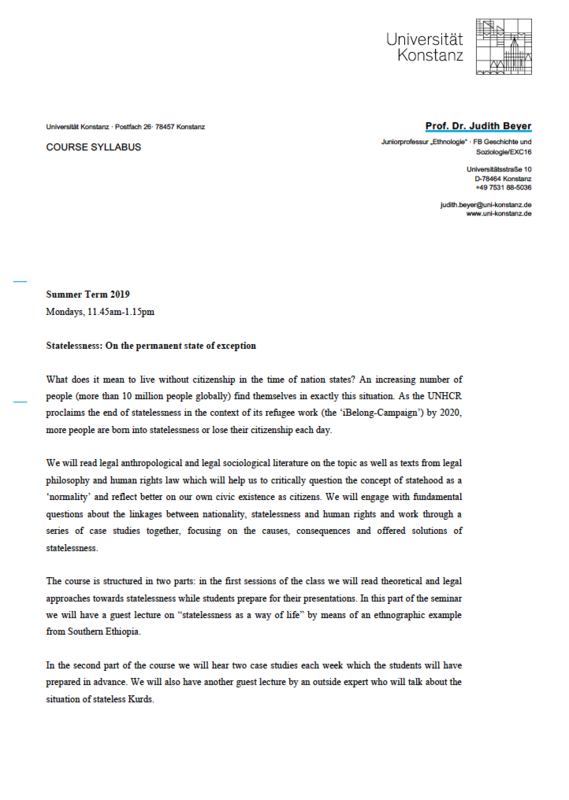 This summer term, I will be back at my University, teaching one course on “Statelessness” at the BA-level for our anthropology and sociology students. 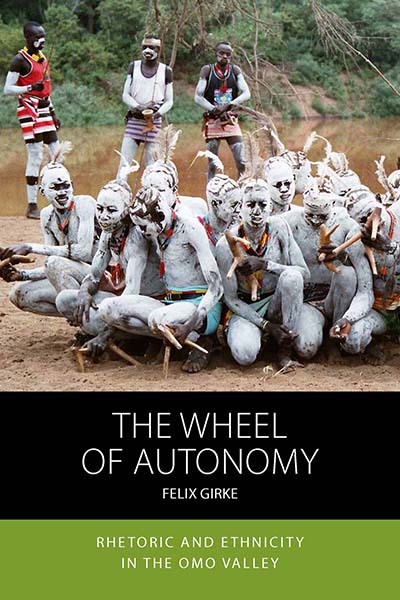 I am particularly looking forward to the two guest lectures: One by Felix Girke (University of Konstanz) who will be exploring how anthropology has traditionally worked with “stateless” people during colonial times and what has happened in areas and to people in South Omo in Southern Ethiopia where the modern state had been absent for a long time, but has now become a cruel force. 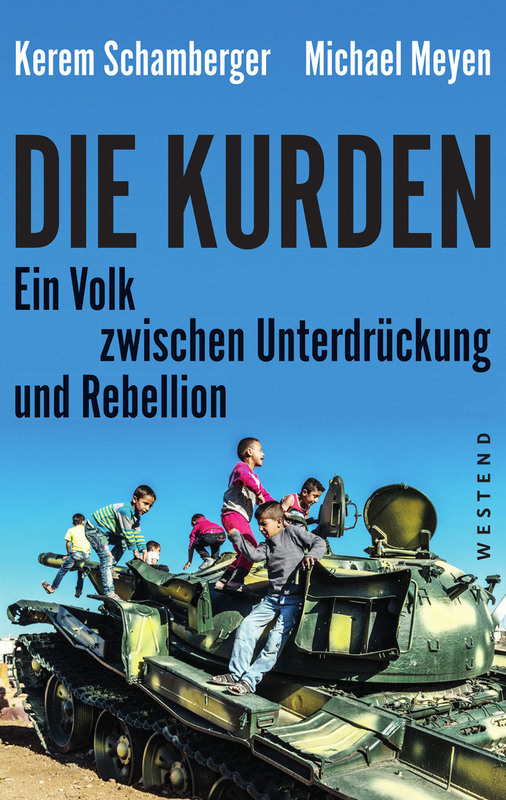 The second guest lecture will be given by Kerem Schamberger from the University of Munich and a political activist, who will present his new book “Die Kurden. Ein Volk zwischen Unterdrückung und Rebellion” (together with Michael Meyen) during the seminar. 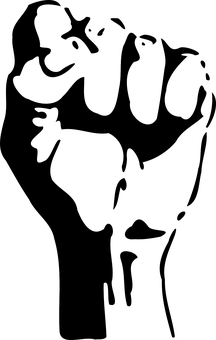 This entry was posted in activism, Allgemein, anthropology, Europe, field research, law, politics, state, teaching on 21. February 2019 by Judith Beyer. In this talk, I offer a unique critique of the concept of ‘postsocialism’, a new take on the concept of legal pluralism, and a plea to bring ethnomethodological approaches into correspondence with ethnographic data. Drawing on a decade of anthropological fieldwork and engagement with Central Asia, I will focus on describing how my informants in rural Kyrgyzstan order their everyday lives and rationalize their recent history by invoking the force of custom (Kyrgyz: ‘salt’). Although ‘salt’ is often blamed for bringing about more disorder and hardship than order and harmony, as I will exemplify with the example of mortuary rituals, it allows my informants to disavow responsibility for their actions by pushing a model of ‘how things get done here’ to the front. Invoking ‘salt’ enables actors even as they claim to be constrained by it, it opens up possibilities to conceptualize, classify, and contextualize large- and mid-scale developments in an intimate idiom. It also is a way to communicate to others that one is an expert in and of one’s own culture. An ethnomethodological perspective, as I pursue it, challenges a conception of social order as hidden within the visible actions and behaviours of members of society. Rather, it examines how members produce and sustain the observable orderliness of their own actions. Migrants from India have arrived in Burma from pre-colonial times onwards up until the Second World War. They crossed the Bay of Bengal out of personal economic endeavours, but having been categorized collectively by the British colonial state already before they embarked on the steamships to Rangoon, their collective identities travelled with them. Next to looking for work, other migrants relocated there to make use of parcels of land that were given to them as a reward for their services in the colonial apparatus or in the Indian army; yet others took up positions in the higher echelons of the administration in Burma. These people entered a Buddhist polity that had been shaped by centuries of hierarchical modes of royal governance – one which included Muslims and other ethno-religious minorities. This talk traces the different types of classifications and reclassifications that were projected onto and subsequently appropriated by ‘Indian migrants’ in order to shed light on the current situation of ethno-religious minorities in contemporary Myanmar, particularly in the city of Yangon. 3. Accountability and justice in asylum claims. Debating the issue of Rohingya statelessness in British courts. Accountability is a reflexive technique by means of which actors realize and lay claim to their actions. In order to be recognizable, accountability “depends on the mastery of ethno-methods” (Giddens 1979: 57; 83). If, as Garfinkel put it, “[a]ny setting organizes its activities to make its properties as an organized environment of practical activities detectable, countable, recordable, repeatable, tell-a-story-aboutable, analysable – in short, accountable” (1967, 33; italics in original), then so-called ‘screening interviews’ in asylum cases of stateless Rohingya are a challenge to this principle as they are defined by non-knowledge about the other. When UK border agents and Rohingya meet, their ‘membership’, which forms the basis of all co-production of action (and knowledge) in ethnomethodology, needs to be established ad hoc in the interview situation. What we can learn from those ‘first contact’ encounters and the subsequent travelling of a Rohingya asylum seeker’s file through the court system, is, I argue, how accountability is constantly being produced through interaction and how, as an important by-product of this production process, not only a ‘case’ is decided, but also the validity of the state’s own account is rendered plausible. In this keynote speech, I engage with the conference topic of “challenging” and even “disturbing” “Grand Narratives” through an investigation of the tradition of orality and the usage of oral history in Central Asia. These are two interlinked endeavours, as oral tradition has been investigated “as history” (Vansina) and oral history understood as “the voice from the past” (Thompson). Anthropologists (of Central Asia) investigate tradition as “a site of necessary engagement that aggregates people, … informs policy, public debates, law, and representation, and is – despite its often enough strategic inception – affectively powerful” (Beyer and Finke forth. in Central Asian Survey). Examples from Central Asia show how “oral tradition”, especially when mediated by state and media apparatus, can take on “grand narrative” qualities. Moreover, in contrast to how oral history has been treated in the past, namely as history “from below”, of “the everyday” and by “the little guys” (Graeber), thus as “little narrative”, as I will call it, it is worth exploring in what ways this method of ethnographic and historical inquiry has the capacity to yield “grand” results. Dans le cadre de la Conférence “CASIO 2.0 : Disturbing Grand Narratives” organisée par l’EHESS et ZMO (Berlin). Le 28 mars 2019 de 10h à 12h – PSL, Salle du Conseil, 60, Rue Mazarine, 75006 Paris. This entry was posted in Allgemein, Central Asia, conferences, Europe, Hinduism, Kyrgyzstan, law, Myanmar, outreach, refugees, teaching on 8. February 2019 by Judith Beyer.